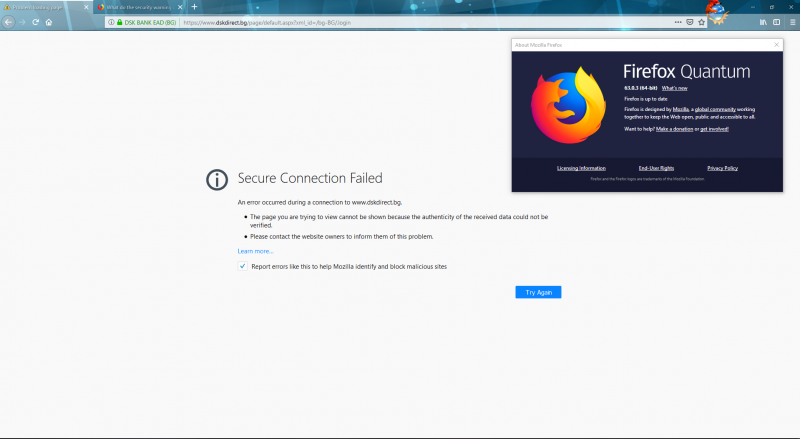 The latest version of the Mozilla foundation browser – Firefox Quantum 63.0, introduces an issue with some websites, where even though there is a valid security certificate, it doesn’t load the page. The below image shows a website that i usually access using Firefox. Other browsers like Edge and Chrome validate the certificate correctly and display the page. Previously there was an option to add an exception and continue to the site anyway (which is also described on the help page), but in this situation it doesn’t exist, probably because the certificate is found as valid. 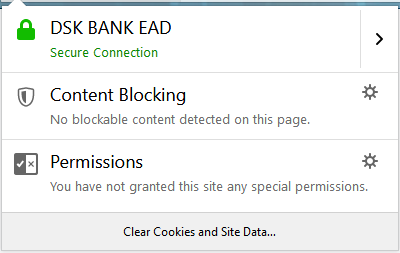 While i do not know the source of this issue, the fix is very simple if you encounter it – click on the shield icon in front of the URL and “Clear Cookies and Site Data”. In the popup click OK after verifying the domain name – this will clear all temporary data in your browser for this website and open it clean, the next time you load the page. This entry was posted in Computers and internet, Daily and tagged Bug, Clear cookies, Cookies, Firefox 63, Firefox quantum, Fix, Issue, Secure connection failed, Security, Security issue, Security warning, Security warning fix, SSL Fix, Warning by Shogo. Bookmark the permalink.